At the MoU signing, Pro-Vice-Chancellor (Research) Professor Jonathan Knight with Professor Guangjin Chen, Director Institute of Sociology, Chinese Academy of Social Sciences. 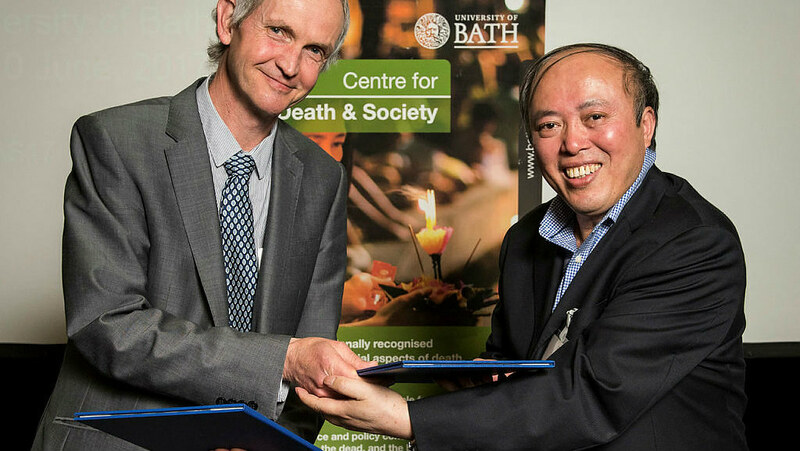 A new international partnership, struck up between the world’s first Centre for Death & Society based at the University and the Chinese Academy of Social Sciences has been signed, paving the way for greater dialogue between West and East on society’s attitudes to death, dying and bereavement. The Memorandum of Understanding (MoU), signed as part of the Centre for Death & Society’s (CDAS) Conference ‘Death at the Margins of Society’ held on Friday 9 June, sets out to improve international research collaboration and mobility for staff and students. It is hoped it will act as a catalyst to develop collaborative future research projects with universities across Asia and Australasia. Bath’s Centre for Death and Society focuses on issues such as individuals’ experiences of death and bereavement, policy considerations on issues such as funeral poverty, and societal attitudes on talking about topics such as death. The Chinese Academy of Social Sciences is the premier academic research and national centre in the People’s Republic of China. The MoU is with its Institute for Sociology. Professor Guangjin Chen, Director of the Chinese Institute, commented: “China is undergoing a dramatic socio-economic transformation, in which death-related studies are becoming increasingly important. I believe the partnership between our institutions will give a chance to more Chinese scholars to confront with and think about death related topics, more importantly, to contribute to cross-cultural understandings between the two different cultures. "This MoU marks a new era of social research between our Institutes. I am excited to see future collaborative projects on a range of topics on social research coming between us. I wish the partnership will lead to excellent achievements in the near future in all related research topics. We welcome researchers and students at the University of Bath to come to visit and study at the Chinese Academy of Social Sciences, in Beijing, China." The collaboration between the two institutions came about in 2016 when PhD student Chao Fang traveled to China to introduce the Academy to the work of CDAS. He said: “Since death-related studies are fairly new in mainland China, researchers from the Institute were attracted to the high quality of research and diversity of research interests of CDAS in terms of death, dying and bereavement. The idea of collaboration firstly emerged during the conference and it was further developed with support from directors of both institutes. During a second visit to CASS, the two institutes agreed to form an official collaboration in order to build bridges from East and West on death, dying, and bereavement scholarship."